My saris are my personal archaeological layers. The turquoise and saffron one was bought from a market in Pune on my very first trip to India. The magenta one with the border of gold thread woven into the peacock pattern came from a cavernous shop in Gujarat, where I sat in a hot daze surrounded by towering stacks of silks. The hot pink one with the silver embroidery was a nod to Mumbai fashions circa 2005 picked up on a whim, along with matching bangles. The sienna and orange one was given to me on my wedding day by my parents-in-law. My saris live in a box and I wear them only when I’m in India. Here, in Belgium, they don’t feel right. A sari needs the context–the music, the movement, the heat, the chaos of an Indian wedding. So I spread them out on the furniture to enjoy their colors, but I drape myself in a sari-like perfume of layers and folds. Like Neela Vermeire’s Niral, for instance. Niral, like Mohur, my other favorite from Vermeire’s collection, is remarkable in the way it interprets India. And I do mean, India, and not merely Bollywood with its flash of tinsel. Niral has the opulence of carvings on the Taj Mahal, the intricacy of spice combinations used in India’s cuisine, and the vividness of Rabindranth Tagore’s poetry. 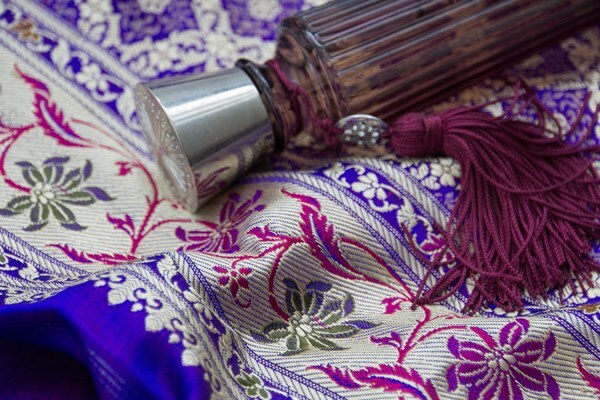 Its main inspiration was silk, and it makes sense to me, because like a Varanasi weave that reflects different colors depending on the light, Niral turns to either violet, rose, jasmine or something else altogether. The very first impression I have of Niral has nothing of the Indian stamp about it. 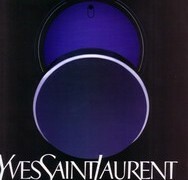 Imagine taking a bit of a candied violet and following it with a sip of champagne. Sweet and shimmering. Intoxicating. Then, the perfume grows warmer, while still keeping the violet-iris tint, except that the purple petals now turn into a dark red rose and the champagne fizz gives way to swirls of sandalwood cream. If that were all to Niral, it wouldn’t be nearly as interesting as it is. Perfumer Bertrand Duchaufour doesn’t try to give us the scent of an Indian market or any other stereotypical image, however. He goes deeper and in between each lush layer he adds a counterpoint that fills Niral with radiance. The rose is edged with the bitterness of cardamom. The sweet violet powder is turned into gold dust by the coolness of iris. The languid heft of sandalwood is laced through with the salty dryness of tea and spice. Niral has a relationship with L’Artisan Parfumeur Traversée du Bosphore, also by Duchaufour, but Niral feels more complete, more intricate and more faceted. One drop is enough to make me dream of India and its colors. Two make me feel as if I had just returned from India, its sun still warm on my skin. Anything more is enough to shut the world out and make me forget that grey skies even exist. Those who worry about fragrance vanishing from their skin should have no complaints. Niral lasts really well, but since its richness is tempered, its presence is not stifling. Even so, I do recommend applying it in small doses, drops even. Not only does it allow you to create a tantalizing aura of scent, it makes you better notice all of its nuances. Niral has notes of iris, tea, pink pepper, rose, green wine lees, angelica seed, ambrette seed, cardamom, leather, magnolia, jasmine, sandalwood and cedar. Emilie: Oh wow! Now I definitely have to find a sample of this one. It sounds spectacular! Victoria: Yes, it’s my purple-magenta sari with a brocaded border. One of my favorites! maja: I tried it in Milan last week and liked it a lot. Neela was out of samples by the time I was there so I’ll need to reorder and sample again. But it really does convey the feeling of raw silk as it has been suggested, sort of dusty, powdery, complex, and shimmering femininity. I am glad you love it. Victoria: Glad to hear that you thought so! Michael: Wow, a five star review? I need to get my hands on Niral. Would you describe it as a floriental? They seem to work very well on me so I’m intrigued to see how Niral sits on my skin. Silvermoon: Judy, you caught my attention, when you wrote that Niral reminded you of Nahema. Please can you elaborate a bit more? I love Nahema and wondered what aspects of it are experienced in Niral? Is it just the top note or does it go further/longer? Judy: I certainly have! I think you’ll love this one, Silvermoon — happy hunting! Silvermoon: One drop is enough to make me dream of India and its colors. Two make me feel as if I had just returned from India, its sun still warm on my skin. Anything more is enough to shut the world out and make me forget that grey skies even exist. Victoria: What is Weekend à Fountainebleue like? I like the name very much. Thank you, as always, for your beautiful article. 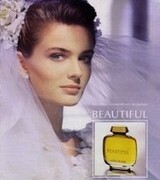 These days I am trying a sample of Amouage Jubilation XXV. I read about it and I wanted to experience such a complex, layered perfume. It changes every few hours and lasts so much. I wear it at home. It is a private exploration. Niral sounds similar to me, in that sense, to Jubilation. Loving barroque experiences or maybe just the complexity inherent to life. Margot: Thank you for this beautiful review. I ordered a sample of Niral after you’d mentioned it in your perfumes for spring post. It is beautiful, but a little too sweet for my personal tastes. My tolerance for sweetness is very low though. I prefer Trayee and Mohur. Niral reminds me of the crispy kind of silk, instead of the type of tussar silk that’s a little more raw and woolly. It must be the fizzy part that does that. Victoria: Thank you for your own beautiful review, with very useful comparisons. Yes, I can see why sweetness would bother someone, especially since here it’s the powdery sweetness. I don’t like overly sweet perfumes either, but the powdery notes appeal to me. So, it’s good to keep that in mind. Margot: It is a beautifully done perfume.